Is the word "U.S." an adjective or a noun modifier in this case? It seems to me that it is an adjective that goes before citizen, because we say "Russian citizen", "Chinese citizen", etc. But if it's a noun modifier, then why can't "China" be a noun modifier, too? Although "China citizen" sounds wrong to me, "(People's) Republic of China citizen" doesn't sound as bad. I know I could always write "citizen of China" and in general, "citizen of [country]", but I'm just curious to know. Why can't you say China citizen? Because you can already say "Chinese citizen". The phenomenon is called "blocking" in linguistics. You don't say something because there's already something else that you do say. For example, you you don't say "gloriosity" ( < glorious) because you can already say glory, even though by analogy with viscous>viscosity, you would think it's a reasonable thing to say. By analogy with U.S. citizen, you think you can say China citizen, but Chinese citizen blocks it. U.S. citizen is different either because it predates American citizen or it means something different. 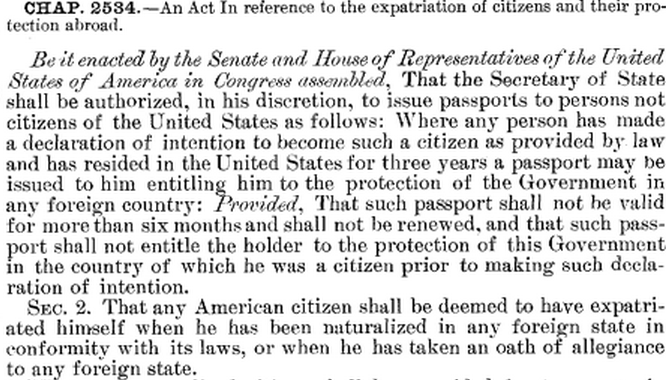 e.g., it's shorthand for the legal term "citizen of the United States" (see below). Also, United States doesn't have a corresponding preposed adjectival demonym, but China does. My hypothesis is that countries where there is no such form, or you don't know it, you treat like "US citizen": Vanuatu citizen, UAE citizen, Papua New Guinea citizen. English speakers, do these sound better than "China citizen"? If you know the preoposed adjectival form, then it blocks the N-N compound: Czech, Russian, Soviet, etc. Why can "U.S." act to modify a following noun? Another guess: it comes from journalism. There are newspaper headlines with phrases like "U.S. troops", "Boston man", "Philadelphia lawyer", etc. which were used in newspaper headlines, then in radio broadcasts, then in television broadcasts. But English can productively form N-N compounds, so when someone says "U.S. citizen", a native speaker can make a good guess about what it means, even if he/she hasn't heard it before. E.g., a freshly-coined, highly embedded series of N-N compounds such as dog food factory management regulations will be understood by most English speakers. The provisions of this act shall apply to all subjects of China and Chinese, whether subjects of China or any other foreign power; and the words Chinese laborers, wherever used in this act shall be construed to mean both skilled and unskilled laborers and Chinese employed in mining. This is very good question. We do in fact say “a United States citizen”, “a UK national”, “the PRC government”, but we do not say *an America citizen, *a Britain national, *the China government. There seems to be an unwritten law that says you can form compounds from multi-word country names (or from abbreviations of the same), but not from single-word country names. (2) *He is a China citizen. In (1), which is grammatical, the abbreviation "U.S." or the words "United States" is not a full-fledged noun phrase but some sort of modifier of "citizen". Note that it lacks the definite article "the", which will always be required when it's used as a noun phrase, as in "He is a citizen of the U.S." or "He is a citizen of the United States." Therefore, it can be inferred that the word "U.S." or "United States" in (1) is somehow deprived of the definite article, i.e., its definiteness, to be able to function as a modifier of "citizen". In other words, there might be some unwritten rule--or a rule I don't know of--that a noun or a noun phrase must not be definite in order to act as a modifier of another noun. Unlike "U.S." or "United States", on the other hand, the word "China" is a proper noun and thus inherently carries definiteness. So a proper noun such as "China" cannot act as a modifier of "citizen" as shown in ungrammatical (2). *He is an America citizen. *He is a Korea citizen. *He is a Japan citizen. The name of the country is the United States of America. So the adjective would be American. But American is ambiguous as it can refer to the whole double continent and an American may be from South, Central or North America. That's why one uses U.S. as a substitute to avoid ambiguity. This problem concerns mainly the USA. We do say "Chinese citizen". So this is really a question about why "United States" can be used as an adjective. My best guess is that it's a historical accident, evolving from "United States' citizen" where the trailing apostrophe indicates that it's intended as a possessive. Over time that may have been miswritten as "United States citizen", and that may have been common enough to become an accepted alternative. Not the answer you're looking for? Browse other questions tagged grammar adjectives attributive-nouns ethnonyms or ask your own question. Is it common to use the borrowed noun-adjective form for borrowed French phrases? Why do we say “acid rain” and not “acidic rain”?